It’s Halloween and you want to be scared, but the bourgeois suburban life you lead has a scare factor somewhere between finding a spider on your wall and doing your taxes. The real world rarely inhabits that strange, creepy atmosphere you crave when the moon rises and All Hallows’ Eve is just around the corner, so you must go find it for yourself. Haunted houses are the perfect way to do this. It is a ready-made world of terror and dread waiting for you, complete with special effects, winding corridors, and monsters that jump out when you least expect it. 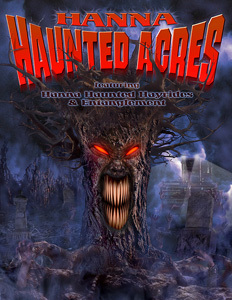 The best haunted houses fully encapsulate that dark, surreal atmosphere where reality has shattered into a world of horrors, and the only escape is to continue through the fog-laden cemetery, the catacombs of skulls, the torture chamber, and the phantasmagoria of an acid trip gone awry. Last weekend I visited Hanna Haunted Acres in Indianapolis, a festival of the macabre with six attractions in the middle of an empty field surrounded by cornstalks and trees. I went on a dreary night, drove down the dirt road, walked through the mud, and was fairly pleased by the experience. The six attractions are as follows: Scare Crow Revenge, Medical Malpractice, Hanna Haunted Hayride, Phantazmagoria, Blackout, and Carnevil. Scare Crow Revenge promised to be a haunted corn maze, but the corn stalks were low enough that you could always see which direction the lights of the park came from, and by “haunted,” they meant a few bored workers occasionally jumping out of the corn. Medical Malpractice was a pretty good horrorshow of science and surgery gone horribly wrong, all set to almost constant strobe lights and a soundtrack that includes Evanescence. The Haunted Hayride was definitely a highlight. You wind through the woods with costumed folk jumping onto the ride every so often while giant spiders hang overhead and Satan himself hovers among the trees. It ends with a bang, as a demon truck starts to tailgate the tractor, and you speed through the woods to escape the approaching lights. Phantazmagoria and Blackout were both pretty standard haunted house fare, with some attempt at that whole “wander through pure darkness” bit. Carnevil was the other standout, as a 3-D clown-themed walk-through with trippy fluorescent paintings popping out at you. A few days ago, I hit up another haunted house right here in Chicagoland called Screams in the Park, just next to Muvico Theater in Rosemont. This one promised a cohesive theme: the home and torture chamber of Chicago’s first serial killer, H. H. Holmes, made famous by Erik Larson’s Devil in the White City. For those who don’t know, Dr. Henry Howard Holmes, whose real name was Herman Webster Mudgett (1861-1896), terrorized Chicago at the 1893 World’s Fair. He built a hotel of horrors for the visitors and there killed somewhere between 4 and 200 people (he confessed to 27). This hotel was known as the Murder Castle and contained a maze of windowless rooms, doors opening to brick walls, strange angles, and other such labyrinthine architecture that belongs in the Winchester Mystery Mansion. The haunted house did a nice job portraying some of the more gruesome and eerie aspects of this theme. The facade is a foreboding castle-like entrance leading into the skull-lined hallways of the hotel, where you encounter victims desperately trying to escape Holmes’ wrath, mutilated corpses, and dark passageways. You also find a spooky graveyard with a huge monster, among other things that don’t seem to fit with the theme, but the effects were all so well done that I hardly noticed the deviation. If you’re willing to shell out the cash to visit a decent haunted house (will run you in the range of $15-25; go on a week night and it’ll be cheaper with a shorter line), then I suggest you research some good local haunts, scour their website, Facebook page, and Groupon for discounts, and get scared! Thanks for the post, Joanna. We have one or two places to visit here in the California Central Valley area where we live. My oldest has gone before, but I have yet to do so. Perhaps this is the year! See you during the Coffin Hop. Awesome! If you find any good ones, leave another comment; I’m sure people in your area would love to know where to go and where not to go. Wish I had the money to hit up all the haunted houses around here and rate them, but I figure my paycheck could probably be used in more productive ways. i wonder if, ina 100 years or so, there will be haunted houses memorializing John Wayne Gacy’s backyard and crawl space? That would actually make for an awesome haunted house theme. Clowns often appear in haunted houses these days because, let’s face it, clowns are kind of creepy. Making a haunted house based off a real life killer clown sounds like it would draw in a good crowd. Should we go into business together for next Halloween on our new haunted house idea?